Hotel Tivoli is a two-star budget hotel in central Venice. There's no romance or glamour on offer, but it is a clean and efficient place to stay, and pretty good value for money. I booked a single ensuite room at the two-star Hotel Tivoli in May 2006. I was able to make the online booking at short notice for €70 for one night (I could have paid less had I opted for a shared bathroom). This was a fairly good price, although for the same amount, I had spent the previous night at the smart three-star Hotel Campiello. Hotel Tivoli is in the district of Dorsoduro, very close to the San Tomà vaporetto stop on the Grand Canal. It's also within walking distance of Piazzale Roma and the railway station, although it wouldn't be much fun dragging suitcases along alleys and over bridges. It's easy to find from the ferry stop. This is a good location. What nightlife there is in Venice tends to congregate around Campo Santa Margherita, only a few minutes' walk away, where you'll find cafes and late-night bars. This area of Venice is an interesting one to explore - Dorsoduro is more low-key than the touristy San Marco. There are some lovely canals and some of Venice's big architectural and artistic sights, but also a sense of being lived-in. Local people wander the streets or sit at cafes, and we see a fruit and veg. boat selling wares on one of the canals. As well as the vaporetto stop around the corner, there is also a traghetto service crossing the Grand Canal which is both a cheap way to travel in a gondola and a convenient way to cross the water. The hotel staff I encounter are pleasant if rather impersonal. The evening receptionist did not speak much English, nor could he provide any advice about Venice or its services ("I'm not from here"). He handed me his telephone to communicate with a lost French tourist in English; I only hope the lost guest found their way to the hotel eventually. The Tivoli is a rambling hotel with accommodation going off in all directions. My room is up some steps, down some more steps, across a small courtyard (with doors which bang noisily) and up a flight of stairs - not too enjoyable with a heavy suitcase. My door is directly off the staircase. The single room is small but adequate. The floor is tiled, with a small rug - all the furnishings, in fact, seem rather undersized: the wardrobe, the desk... even the bed seems rather low and small. In a further space-saving move, the television is up by the ceiling, making it rather uncomfortable to watch. I suppose no-one comes to Venice to watch television, but it seems a bit much that I have to stand on a chair to turn on the set, and go to reception to locate the remote control. I also have to stand on the chair to close the bathroom window. It does seem to be the only ventilation, but I'm worried about draughts and mosquitoes. Although space is at a premium, the furnishings are all decent and the bathroom too is clean and contains everything necessary. Breakfast is served for an unusually short period: from 8 - 9:30am, which doesn't allow for too much flexibility. Tables are numbered according to room in the good-sized breakfast room overlooking the garden courtyard. There's a choice of cereals and snacks, the usually watery sugared fruit juice (the bane of this trip), a range of teas and some very good fresh filled croissants - the best breakfast food I eat on this five-hotel trip. I only stayed in the hotel one night, but I wouldn't hesitate to stay longer on a busy sightseeing trip. My room wasn't a place I'd want to sit in for long, but as a base it was fine. 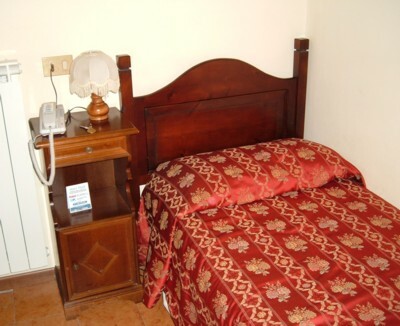 The hotel is very much a budget establishment, but it was friendly, efficient, clean and family-oriented. I was impressed to see a printout of the weather forecast displayed on reception. I was surprised by how quiet my room was (despite being located on a staircase) and I enjoyed a good night's sleep. Hotel address: Dorsoduro - Crosera San Pantalon 3838. Although you could save money by walking from the station or the bus stops on Piazzale Roma, I'd recommend arriving by vaporetto - it's far more exciting and saves dragging your suitcase along the canals. Hotel Tivoli review by an Italy Heaven editor.